This short activity gives students a chance to review qualitative and quantitative observations and then work together to practice identifying each type of observation with everyday objects. The objects can be anything the teacher has available: a paperclip, a textbook, a ball, or Silly Putty. Directions are included in the document. 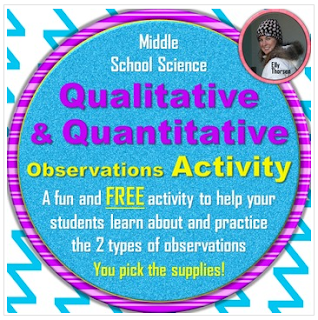 All of the resources you see above can be purchased together at a discount as part of the Qualitative and Quantitative Observations Bundled Science Package.